As a Biodynamic Craniosacral Therapist, I listen and follow your body’s lead that knows how to reorganize an issue. In a session, you’ll lay fully clothed on a therapy table while I use my skills of perception with gentle to firm hands-on techniques that will allow your body to express its health dynamically, by connecting to its inherent wisdom that knows how to reorganize itself. With a compassionate intention, I support your body's ability to find stillness that resonates a state of balance and calm. At this stage, the force of impact, stress and trauma meet with the abiding health within you where healing responses unfold into deep reorganization, balance and integration. You are likely to feel a sense of calm and deep relaxation at the completion of a session. Just about everyone, from pre-born babies and their mothers to the elderly; all ages can benefit. People of any age and in any stage of illness or recovery will find benefit as it works to bring the inherent health of the clients system forward in a gentle yet profound way that is wholistic, safe, and honoring of the client. Adrenal Fatigue and Adrenal Stress, Alzheimers, Anesthesia, Anxiety, Asthma, Autism, Auto Accidents, Balance Issues, Central Nervous System Disorders, Chronic Fatigue, Chronic Neck and Back Pain, Chronic Sinus Problems, Circulation Disorders, Colic, Feelings of Compression or Pressure, Concussions, Confusion, Dental Problems, Depression, Dementia, Emotional Difficulties, Fibromyalgia and other Connective Tissue Disorders, Headaches, Head Injuries, Impingement of Cranial Nerves or Spinal Nerves, Acute and chronic inflammation, Left-Right Imbalances, Learning Disabilities, Memory Problems, Migraine Headaches, Motor-Coordination Impairment, Neuro-Endocrine Problems, Neuropathy, Neurovascular or Immune Disorders, Organ Congestion and Dysfunctions, Orthopedic Problems, Acute, and Chronic Pain and Stress, Pre and Post Operative Care, Pregnancy issues and complications, Scoliosis, Sports Injuries, Temporomandibular Joint Syndrome (TMJ), Tinnitus, Traumatic Brain and Spinal Cord Injuries, Vagal tone and heart rate variability, Vertigo, and Trauma of all kind — Accidents, Anesthesia, Births, Falls, and Other Injuries, Loss-Grief, Physical, Sexual or Emotional Abuse, Sports Injuries, Post Traumatic Stress Disorder (P.T.S.D. ), Surgery Recovery. Biodynamic Craniosacral Therapy can help enhance the healing process when used in conjunction with other healing therapies. Some commonly known therapies include but are not limited to Acupressure, Acupuncture, Auto-Immune Protocols, Chinese & Herbal Medicine, Chiropractic Care, Dental Care, Detox Protocols, Functional Medicine, Homeopathy, Hospital Care, Massage Therapy, Medical Treatments, Nutrition, Physical Therapy, Pregnancy & Birth Preparation, Reflexology, Surgical Procedures and Stress Management. All forms of craniosacral therapy were developed to work with the subtle and gentle expansion and contraction discovered as the polyrhythmic cycle using light to firm touch that is quieting and relaxing. It addresses the rhythmic system at the core of our physiology – the pulse of fluid energy that flows between our head and pelvic area. This is as essential, measurable, and tangible as our breath and heart beat. In full expression we have health, if obscured we have problems. The practitioner works with the bones of the skull and the pelvis that affects the deeper layers of membranes and cerebrospinal fluids in the spinal canal, the brain, and the spinal cord itself. Why is this important? A pulse through the fluids proceeds through the entire craniosacral system, like an ocean wave. From sutures in the skull to the spinal cord, it cycles about six to ten times a minute causing tiny movements. “It’s a hydraulic system,” says Dr. Upledger, noting how all the components work together to regulate the pressure of these fluids on the brain. “There has to be an optimal circulation, which depends on constant mobility,” he explains. When the membranes and lubricating liquids lose their freedom to glide freely, we hurt and symptoms start. Craniosacral therapy helps the body to re-establish an unobstructed wave, which is how symptoms disappear. It is a form of craniosacral therapy that is less manipulative. Instead of figuring out the client’s problem and forcing tissues toward an ideal symmetry, the practitioner creates a supportive environment for the client’s system to settle and generate a therapeutic change from within. A skilled practitioner listens to the subtle pulsations of the system as the body tells its story through its rhythms, micro-movements and especially through how it has managed its experiences in patterns of physical shaping. With deep listening the practitioner encourages revitalization of the inherent healing potential of the system, and facilitates the release of patterns of resistance. This approach focuses on listening to the health of the system and encouraging its expression and supporting and nurturing its natural expression. 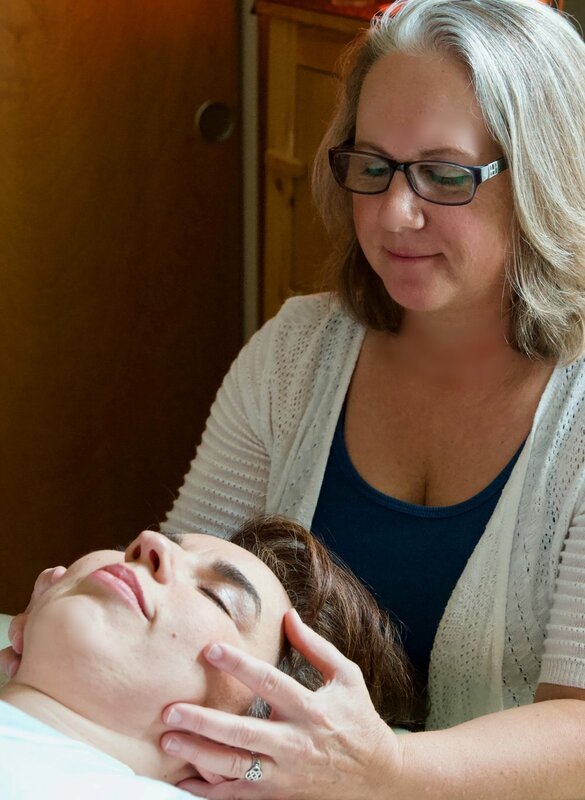 Biodynamic Craniosacral Therapy is a gentle hands-on work that honors the client’s own self-healing process. When your body is injured, stressed or traumatized, or when you are under emotional or mental stress your system learns to compensate, hold patterns and adapt using whatever resources are available. Your body's health has not been removed; it is still there holding the compromised areas so your body can function. Biodynamic Craniosacral Therapy can help support any situation you find yourself in. When your body is in a state of stillness and calm, the natural forces that are always in motion, can work on deeper levels, reorganizing issues created by life experiences. Stress affects every part of you, from a cellular level to a muscular level and everywhere else. Calming your nervous system can help restore or help maintain balance to the many layers of your body. During a session, I administer light to firm touch, helping your body reach a state of settling within your nervous system that helps lead you into a state of stillness. I continue supporting areas of your body as they work to restore motion, flow and function. Your body does the work to reorganize states of imbalance caused by stress, injury, trauma and other impacts from life experiences. You are likely to feel a sense of calm, relaxation and restored wellness and vitality at the completion of a session. You can email me to arrange a session, discuss rates, or address any questions you may have HERE.